Everywhere, the shopping season is about to begin. Everywhere, that is, except at “the most complete retail destination in New York City, the most alluring retail landmark in the world,” as the luxury Westfield World Trade Center mall describes itself. 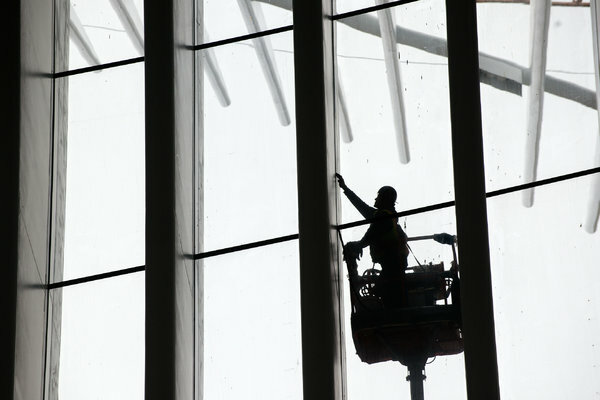 A persistent water leak is among the problems that have delayed the opening of the mall, which was supposed to be operating by now, to the first half of 2016. 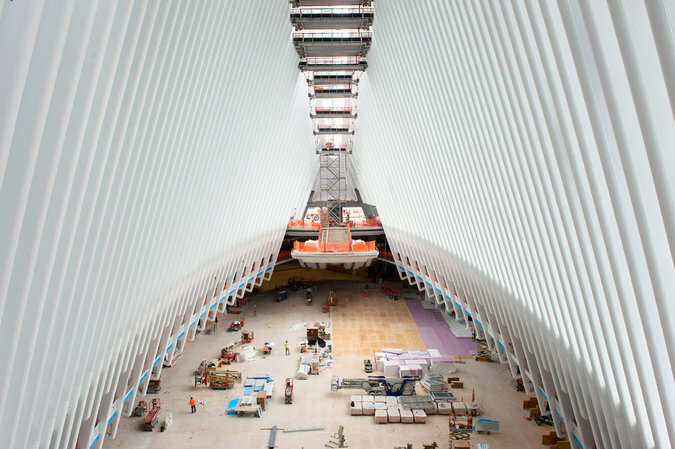 It is the latest setback to bedevil the World Trade Center Transportation Hub, the $3.7 billion rail terminal that will also house Westfield’s $1.4 billion shopping center. The problems of building such a complex, if spectacular, structure have swollen its price tag to nearly double the estimate when plans were announced almost 12 years ago. Once the hub finally opens, an awe-struck public may forget the tribulations. But at the moment, they seem never-ending. More than 100 tenants — including Apple, Daniel Boulud, Eataly, Michael Kors, Kate Spade, John Varvatos and Stuart Weitzman — once believed they would be doing business by now with thousands of office workers from Condé Nast, Goldman Sachs and elsewhere; with PATH commuters and subway straphangers; tourists drawn by the National September 11 Memorial and Museum and the One World Observatory; and neighbors. Westfield World Trade Center is actually a four-block-long interconnected network, occupying the bases of four towers and the concourses among them. 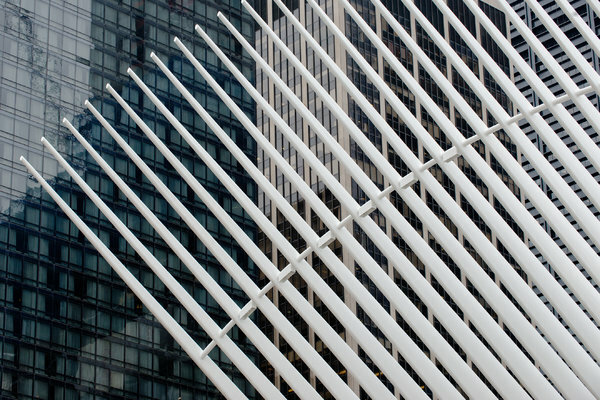 But its centerpiece will be the soaring, winged Oculus, at Church and Fulton Streets, designed by Santiago Calatrava. Besides being ringed by two levels of stores and restaurants, the Oculus will also serve as an event space in which Westfield will stage concerts, performances, broadcasts and fashion shows. Two years ago, the Westfield Corporation and the Port Authority of New York and New Jersey, which owns and is redeveloping the World Trade Center, said the mall would open in 2015. In August, however, Westfield told its investors that it would not open until the first half of 2016. Authority officials and Westfield executives say they are working together to overcome last-minute hurdles and get the space ready as soon as possible. The latest twist involves water penetration around the construction site of 3 World Trade Center, an office tower abutting the hub, which began in late summer. What pedestrians perceive as the solid ground level around the 16-acre trade center is in fact the roof of a 70-foot-deep underground complex that includes much of the hub, including the PATH platforms and many of Westfield’s spaces, most of the memorial museum, 1,000 feet of the No. 1 subway line and enormous mechanical areas. As many roofs do, this one began springing leaks. The Port Authority traced the sources of the water to the constant spraying done by workers to reduce dust levels as they break up concrete, and to the fact that Tower 3, still under construction, is open to the elements. Coincidentally or not, DNAInfo reported on Aug. 25 that workers at the trade center were hearing the sound of water behind the walls in the lower concourses and said there were fears the seepage was coming from the slurry wall lining the foundations. The authority replied at the time that “its most recent inspection did not identify any leak in the slurry wall,” a situation that would have required a full-scale evacuation of the site. It did not elaborate on other possible leak sources, however. On Tuesday, Steven Plate, the director of World Trade Center construction for the Port Authority, said: “The dripping has been reduced dramatically. We’ve made some significant progress. Several spaces are dry.” He said the leak had affected only four of Westfield’s retail spaces. Westfield, for its part, is reluctant to take possession of any spaces until all of them can be delivered in acceptable condition. The leaks have proved to be one of several sticking points. The authority expects to begin turning over retail spaces in the Oculus to Westfield “any day now,” Mr. Plate said. 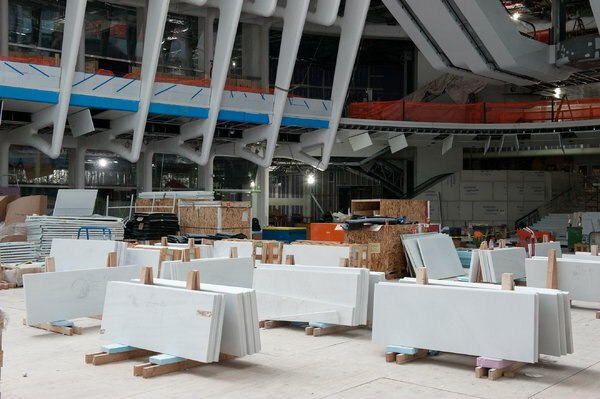 Eataly is already in possession of its space at 4 World Trade Center and has begun building. The Oculus should open in the first half of 2016, Mr. Plate said. During a visit on Monday, it looked fairly close to completion. Though the vast floor of grayish-white Lasa marble from Italy was largely covered by plywood, not much imagination was needed to see the glowing, cathedral-like space filled with visitors. By fall of next year, two new PATH train platforms are to be in service, in addition to those already used by commuters. Finally, the mezzanine above the platforms, which is linked to the Oculus by a grand staircase, is to be finished by the end of next year. The authority has abandoned its plan to open an interim passageway through the Oculus. Mr. Plate said he believed costs could be held to the lower end of the total budget range of $3.74 billion to $3.995 billion set jointly by the authority and the Federal Transit Administration in 2012. He added that he was pushing construction as hard as possible to get all three elements — Oculus, platforms and mezzanine — open sooner. The chief operating officer of Mr. Boulud’s Dinex Group, Brett Traussi, said his company understood that it was getting into an extraordinarily complex and challenging construction project when it signed a lease for an Épicerie Boulud bar, restaurant and grocery store. It had expected to be open this summer. “It’s bought us a little bit of time to be more prepared,” Mr. Traussi said of the delay. The hair stylist John Barrett is adding a fourth salon at the World Trade Center to those he already runs at Bergdorf Goodman and on Bond Street in Manhattan, and in Palm Beach, Fla. He, too, had expected to open this summer. The latest word, Mr. Hedges said, was that Santa will arrive in January.